...it allows you the User to grant access to your private resources on one site (which is called the Service Provider), to another site (called Consumer, not to be confused with you, the User). While OpenID is all about using a single identity to sign into many sites, OAuth is about giving access to your stuff without sharing your identity at all (or its secret parts). The reason I needed OAuth was to interact with the Google Contacts API. I've always hated how sites make you import all your contacts from Gmail. I wanted to develop a system that'd let you simply read your contacts from Google in real-time. Since the application I'm working on uses GWT, I chose to implement an OAuth client in GWT. After googling for "gwt oauth", I found two examples. Unfortunately, neither worked out-of-the-box. The good news is I did manage to create a working solution. The bad news is it only seems to work at random. That's right folks, I created a solution that only works 50% of the time. I'm somewhat embarrassed to post it here, but I also realize the power of open source and community. By sharing, I hope we can find the flaws in my logic and come up with a solution for all GWT applications. 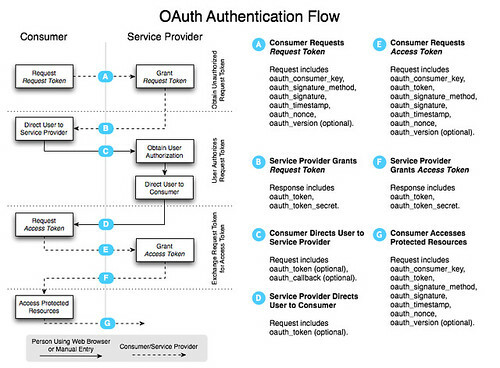 OAuth consists of several steps. The following diagram explains the authentication flow nicely. Get a token from the service provider. Redirect user to service provider to grant access and redirect back to application. Request access token to access protected resources. Access protected resources and pull/push data. To access a service provider's OAuth service, you'll likely need to start by registering your application. 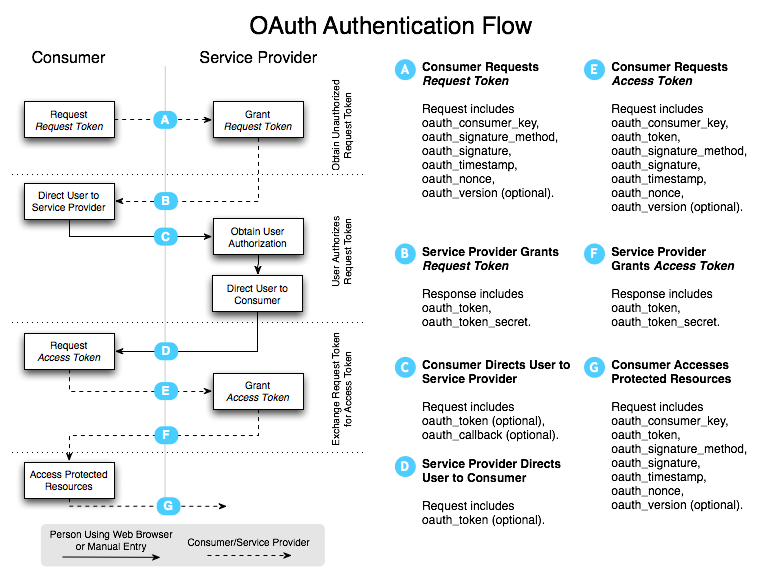 For Google, OAuth Authentication for Web Applications is an excellent resource. Google's OAuth Playground is a great way to with the Google Data APIs after you've registered. If you try this with Google's Request Token URL in GWT's hosted mode, nothing will happen. Compile/browse to Safari and you'll still see nothing. Try it in Firefox and you'll see the following. To workaround browsers' Same Origin Policy, I added a proxy servlet to send the requests. I started with Jason Edwards's ProxyServlet and modified it to fit my needs. I then registered it in both *.gwt.xml and web.xml. Now, before calling the send() method, I replace the start of the URL so the request would be routed through the servlet. The next step is to authorize the token. This is where things got tricky with my proxy servlet and I had to add some special logic for GWT. Google was sending back a 302 with a Location header, but it wasn't hitting the onResponseReceived() method in my callback. For this reason, I had to change it to a 200 status code and add the redirect location to the body. I also discovered that sometimes they'd return an HTML page with a <meta http-equiv="refresh" ...> tag. When using Twitter, I discovered the full HTML for the allow/deny page was returned. Below is the callback I'm using. WindowUtils is a class I got from Robert Hanson and the gwt-widget project. The 3rd step is to get an access token. The most important thing to remember when you do this is to include the "oauth_token_secret" value when signing the request. After this completes with a 200, I create the cookies again (since oauth_token and oauth_token_secret are returned in the body), then call the API to get a list of contacts. The ContactsRequests class is responsible for making the call. The DefaultRequest class contains the send() method as well as utility methods to get the cookie values of the oauth tokens. If all goes well, the response contains the data you requested and it's used to populate a textarea (at least in this demo application). Of course, additional processing needs to occur to parse/format this data into something useful. This all sounds pretty useful for GWT applications, right? I believe it does - but only if it works consistently. I sent a message to the OAuth Google Group explaining the issues I've had. To make it easier to create a robust example of GWT and OAuth, I created a gwt-oauth project you can download or view online. Please keep in mind the demo is likely to be flakey. If you're persistent and try enough times, it's likely to work. Firefox seems to succeed moreso than Safari or Chrome. If you have any suggestions for improving this example, please let me know. We should just build this as native GWT library. I'm wary of using JS libraries for critical functions like that. OAuth not terribly complex, if there is Java source code examples it's not hard to refactor them to be GWT translatable. I already have working (unit tested) SHA1 and HmacSHA1 code to contribute. It would also be nice if this library was abstracted enough so it can be used with RequestBuilder or with the (upcoming) RPC enhancements which will let you plug in a handler to sign requests before they are sent. I'll check out the project and see what I can do. @BN - Thanks for the suggestion, but unfortunately it doesn't help with Google. I just tried it 5 times with your change and 5 times w/o. It didn't work on any attempt. Works every time with Twitter though. @Dan - are you referring to the first commenter (Mark) or me (Matt)? In case it's me, I'm fine with you using this code as long as credit is given (a link to this blog post or the demo is fine). However, you also might check out the last commenter's links to gwt-gdata and its demo. Thanks! I was actually interested in Mark's native GWT implementation of HMAC SHA-1 that he references in his comments. I want to integrate it into the gwt-crypto project if he's amenable. (Sorry if I wasn't clear.) I would have sent him an email or contacted him via his website, if he had left that. I just found someone who seems like they might be that Mark--I'll send an email to him directly. "Visit the following documentation to learn more about authenticating with AuthSubJS: http://code.google.com/apis/gdata/client-js.html#Authenticating"
@othman - the ProxyServlet is used to get around the cross-domain issue in web browsers. If you run "mvn jetty:run" with the example, it should work just fine. 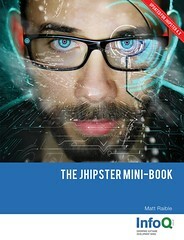 If Eclipse doesn't work for you, I'd try IntelliJ IDEA - it has much better Maven support. hi- i'm trying to run your code from my eclipse IDE with GWT plugin. what is the ProxyServlet use in this code? and why in some portions you replace some url portion with another url that you called proxiedURL? why not use direct url and use a proxied url? when i run the example it says file not found for URI: /google/accounts/GetRequestToken etc.. can you tell from where comes this error message?